The Toddler room, a large room in the downstairs area of the nursery, is a multi-purpose room where children of a similar developmental stage can learn, play and experiment using a wide range of activities. 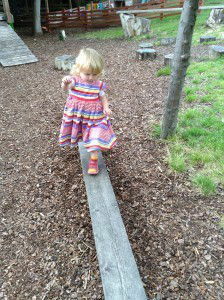 The resources include holistic and heuristic play, dressing up, stories, playdough, baking, sand and water activities. We also encourage the children to participate in ‘free play and child-led activities as well as organising activities based upon the children’s interests and next learning steps. All activities and equipment are rotated and replenished to ensure that each area remains stimulating and interesting for the children. We follow the Pre-Birth to Three curriculum to provide challenging play experiences for the children. We aim, through these practises to further develop the children’s capacity for learning as well as their self esteem and confidence. Detailed obervations and assessments are taken by experienced staff in order to keep an accurate and informative record of each child’s development. These records contribute towards each child’s individual next steps in learning. The children frequently enjoy playing outdoors with bats and balls, rackets, cars, bikes and water and sand. The children also play in the Mud House, Willow den and upon the climbing frames. There are always lots of adventures and learning experiences for the children to enjoy at Happy Days!